January 4, 2007, Kathi and I were staying at the San Francisco RV Resort in Pacifica, CA. We were in the San Francisco area to see our son, AJ. The RV Resort is right on the Pacific Ocean. You could walk from the park to the beach fifty yards to the west. They had 188 spaces for virtually any size RV. Monthly rates were over $1,000 and there seemed to be a few permanent guests. 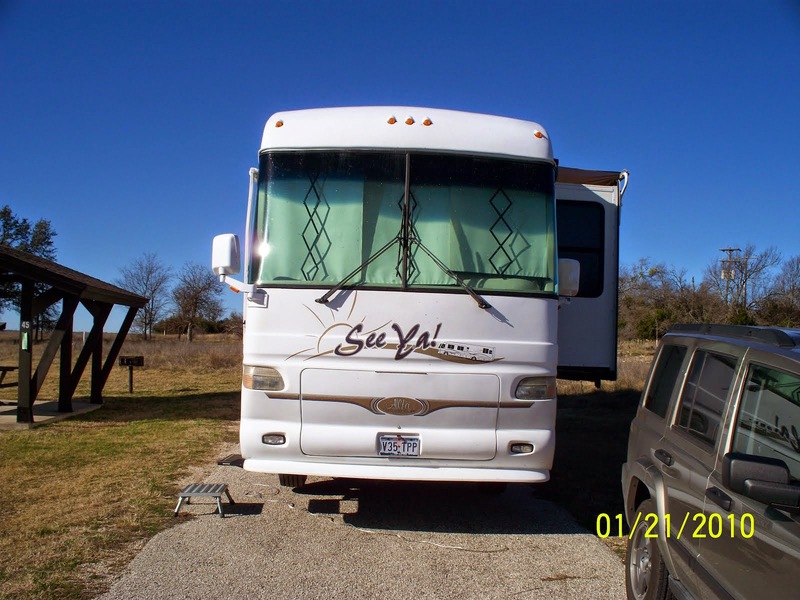 I guess that should not surprise anyone, because a lot of people own RV's that cost millions of dollars. Where do people get that kind of money? I should have gone to business school and got a degree in finance, instead of my math degree. View of the back side of the RV Resort overlooking the Pacific Ocean. The park had all the normal amenities for guests including an office and convenience store combination, a laundry, a clubhouse, a kid's play ground, a pool and even a BBQ/picnic area. Pretty fancy. 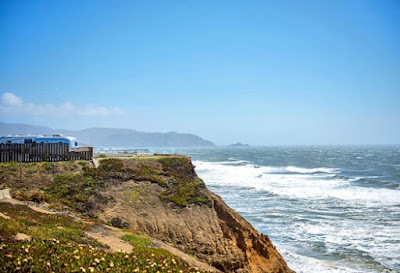 The city of Pacifica is a compact community of about 40,000 people crammed into a 12 square mile area along 6 miles of beach on the Pacific coastline. 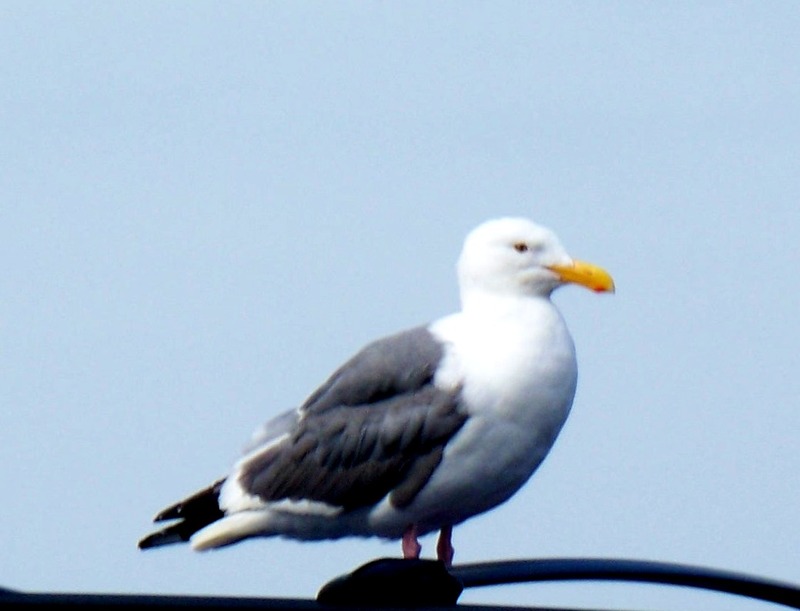 It is in San Mateo county and is about half way between San Francisco and Half Moon Bay. Temperature ranges from the high 50's to the low 70's. Seventy five degrees is a hot day in the Bay Area. January 4th was a Friday and we awoke to heavy rain and high winds. It obviously had rained all night and there was no electricity in the park. How can you call yourself a resort with no backup generator? Of course, no RV park would have a back up generator. We take electricity for granted in the United States and we should. It is available 99.9 percent of the time. 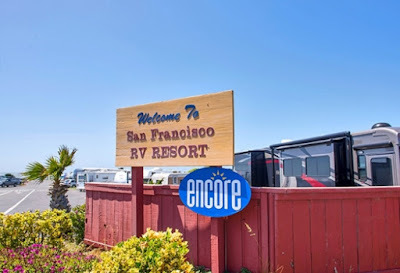 In an RV park with 188 spaces there were approximately 180 generators available and each RV owner was using their own personal electricity. Kathi and I did the same. Kathi called AJ and made breakfast arrangements, so after we got dressed, we shut down our generator and braved the storm. In Texas, most people do not slow their vehicles in the rain, but in the Bay Area, traffic was slow getting into San Francisco. It was still not a bad drive and we were at AJ's apartment within half an hour. We drove to Mel's Drive-In for breakfast. We had bacon, eggs and toast and listened to music on the juke box. We had a nice conversation over breakfast. There is never enough parking space in San Francisco – real estate is too valuable. Mel had just enough parking space for his customers and there were always cars waiting to park and always a line of people inside waiting for a table, near normal meal time. As soon as we were through eating we vacated to allow the next customer in. There were two cars driving around the parking lot awaiting our space as we vacated. I love commerce in action. We were off to the grocery store to do some shopping. Kathi was determined to put some weight on AJ before she left town. I thought he looked great. If I walked as much as he did every day, I might even be thin. Mucho fun in San Francisco. I enjoy the San Francisco visits so much. I agree with you. I stayed think walking the hills. I guess it is a mom thing. They always want you to gain weight.